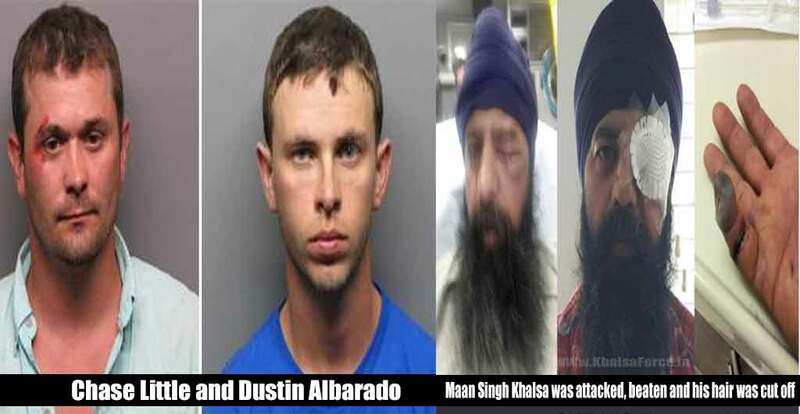 Home » Sikh News » Two Arrested after the Attack According to Richmond Police Lt. Felix Tan. Two Arrested after the Attack According to Richmond Police Lt. Felix Tan. Sikh community leaders are urging that hate crime charges be filed against two men who were arrested on suspicion of severely beating a Sikh man in Richmond, Ca., last month and cutting off some of his hair. Maan Singh Khalsa, 41, was attacked in what Sikh leaders say was a hate-motivated assaulted directed at Khalsa’s religious beliefs and ethnicity. Khalsa wears a turban and maintains his hair and beard unshorn as part of his Sikh faith. During the Sept. 25 attack, Sikh leaders said, Khalsa’s attackers yelled, “Cut his hair, cut his [expletive] hair,” then used a knife to chop off a fistful of his mane. “He hadn’t done anything wrong,” said Harsimran Kaur, legal director for the Sikh Coalition. Chase Little, 31 and Dustin Albarado, 25 of Ponchatoula, La., of Beaumont, Texas, were arrested after the attack, according to Richmond Police Lt. Felix Tan. The Sikh Coalition sent a letter to police and the Contra Costa County District Attorney asking that they investigate the incident as a hate crime. Sikh leaders asked that police arrest and file hate crime charges against a third man, who was also allegedly involved in the attack. “Targeting a Sikh’s turban and hair is analogous to targeting a Jew’s yarmulke or a Muslim’s hijab,” the coalition wrote. The district attorney’s office is investigating Khalsa’s case, and no charges have been filed against men. “The Richmond Police Department is following leads regarding [additional] participants, who witnessed events and/or were directly involved,” Deputy Dist. Atty. Simon O’Connell said. A decision on charges could be made by Wednesday, he said. Khalsa, who is of South Asian ancestry, was driving home on the night of the attack and stopped at a red light in Richmond, about half a mile from his home, according to the letter. A man in a white Ford F-150, which was occupied by at least five other men, allegedly threw a beer can at his car. Khalsa rolled down his window to talk to the man, but truck passengers responded with profanity, the coalition said. The men exited the truck and walked toward Khalsa, who then drove out of the intersection just as the light turned green. Khalsa called 911 to report the attack. But his window was still partially rolled down. At the next red light, the men got out of the truck and attacked him through the window, the coalition said. The men knocked off his turban, hit his face several times, pulled his head out of the window and cut his hair, the coalition said. According to the coalition, the men could be heard shouting “Cut his hair” on a 911 recording. Khalsa managed to drive to a gas station, where he waited for police. “Although Mr. Khalsa explained that he believed his attackers were motivated by bias, the officers appeared dubious,” the coalition wrote in its letter. Khalsa suffered a swollen black eye, dental damage and cuts, and his finger was injured to point of infection and may require amputation, Kaur said. He will also require root canal surgeries, she said. Khalsa, who is a U.S. citizen, has been living with his family in Contra Costa County for seven years. He works as an Information technology specialist for the Social Security Administration as a well as a certified caregiver for the elderly.